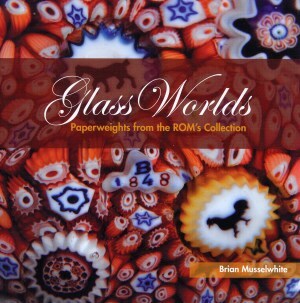 This small format (6 inch by 6 inch) exhibit catalog documents the 2007 exhibit at the Royal Ontario Museum in Toronto, Canada. 75 paperweights are illustrated in the catalog, each with a description. This book includes a history of paperweights and paperweight collecting and glossary of paperweight types and terms (see the sections on Description of Paperweights and Unusual Types of Paperweights). The Royal Ontario Museum collection has over 350 paperweights making it one of four best displays of paperweights in North America. Most of the paperweights are from two estate collections. In 1981, the collection of Mrs. Alice Baldwin Hall was donated to the ROM. This collection of 251 paperweights is focused on French antique paperweights plus those of Charles Kaziun and Paul Ysart. In 1984, the estate of J. 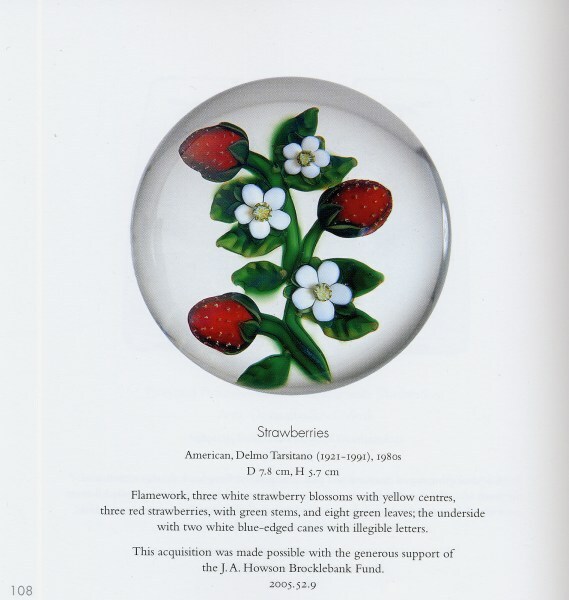 A. Howson Brocklebank added 135 modern American paperweights, including paperweights by Paul Stankard and Rick Ayotte. Other major public exhibitions of paperweights can be found at at the Art Institute of Chicago (Illinois), Corning Museum of Glass (New York), and the Bergstrom-Mahler Museum (Wisconsin). There are also significant collections on display at other museums. This exhibit catalog includes a wide range of paperweights, ranging from fine French antique paperweights from Baccarat, St. Louis, and Clichy to more modern paperweights by Rick Ayotte, Paul Stankard, James Kontes (see picture), Josh Simpson, Debbie Tarsitano, and others. The catalog also includes more common paperweights not usually featured in a museum show and catalog. In all there are 75 paperweights in the catalog each with a clear color photograph. 120 pages with all paperweights in color.